This entry was posted on Friday, October 14th, 2011 at 1:39 pm and is filed under Free Software, GIS. You can follow any responses to this entry through the RSS 2.0 feed. You can leave a response, or trackback from your own site. 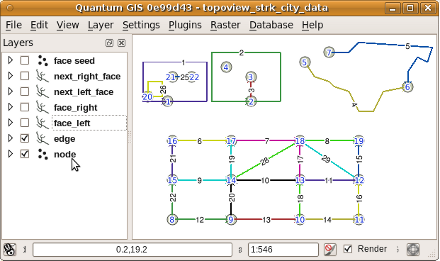 Is there a QGIS plugin for managing PostGIS topologies yet? There’s very basic support in the db_manager plugin to open a set of layers which help you visualize your topology, but nothing more than that yet at time of writing. What kind of management features would you like to see exposed ? I’m not sure the GRASS toolbar would be appropriate for PostGIS topology editing. adding an isolated node, adding an edge, splitting an edge, modifying an edge, removing an edge, removing a node. Topologies constructed through such functions would always be valid as invalidity would be caught by the functions themselves. Such editing would need to be in sync with DB in order to make use of the functions, so would benefit from some locking and possibly versioning support. A drafting design / specification, on qgis wiki, would be essential. Something analogous to ArcSomething topology tools: a (1) topology layer (in memory or else), where we can define the intervening layers/postgis tables, (2) rules (overlaps, gaps, covers, contains), (3) a list of errors, and (4) tools to merge/subtract/create feature/mark as exception or error. This would a plus (++++) if created. Add this to (fast) raster reprojection and good cartographic production tools and say good bye to proprietary software. Agreed on design/specification needs. Not that easy to find the time. If you start it please report the url back here and I’ll take a look. Regarding a big project in Cameroon,I’m trying to test Postgis topology support. Is it possible to define with postgis topology rules before data capture? (Following the example of the geodatabases Arcgis). Is there a qgis extension to defining rules, validate or correct the topology? In your opinion, what is the best PostGIS-QGIS client (qgis,grass, open jump, Udig …) to manage, validate and rectify topology? Thank you to throw light for me. postgis topology has its own base rules defined by ISO SQL/MM, you can build more rules on it, if you want, but not disable the basic ones (like no intersections allowed without a node). Of course you can always build your own topology model with fully custom rules. I’m a Postgis novice..i worked few years with arcgis ‘s geodatabase in order to define between data capture: relations before tables & define strict topology rules. is it possible to do that in Postgis? Regarding my big project in Africa, i need to define strict rules. For instance, i have several faces tables and i would like define before data capture rules : edges communs to several faces would be topologic and honest (of integrity)…Could you throw light for me ?